On Saturday January 15 hip hop heads of all shapes and sizes, colors and creeds rocked the house at the WBEZ Winter Hip Hop Block Party at the Chicago Urban Arts Society. This is the account of how it all went down. And this is the story of how hundreds of fans celebrated and got educated on the past, present and future of this beautiful and dynamic art form that is most certainly not dead. The minute we walked into the gallery of the Chicago Urban Arts Society I knew we were exactly where we needed to be to continue our live hip hop culture experiments that I told you about before. As we absorbed the scene, all the colorful and vibrant graffiti paintings and hip hop artwork seemed to flow off the walls and wrap around my heart and mind putting me the perfect mood to celebrate one of my favorite musical genres all day long. I looked around and saw toddlers, teenagers, parents, college students, old and young hip hop heads who were all buzzing about the gallery too as we waited for the event to begin. The vibe in the gallery reminded me of our community of groove experiment, the Haiti Benefit concert and what our friend Talib once said about the culture of the call and response. 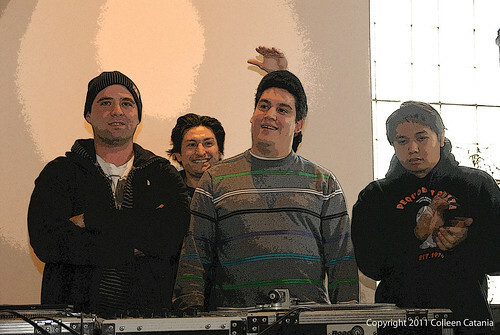 As we told you previously, part of the Block Party involved a live lesson on sampling and a special competition where listeners and local beat-makers competed in a MashUp contest leading up to the Saturday’s events. So here are two MP3s, one capturing an excellent trip through the art and history of sampling courtesy of DJ Epic and Vocalo.org’s Jesse Menedez, and one featuring the three Mashup Finalists and their MashUps. In case you’re wondering, I recorded all the MP3s with the new Blue Microphones Mikey , I’ve been testing it out these last few weeks and these recordings turned out real nice. And so far I’m super pleased with the Mikey’s portability and quality to record great live sound. I’ll be doing a full review on the Mikey on a future post but for now, here’s the goods I recorded for you. Listen closely as DJ Epic journeys through some of the classic hip hop songs and shows you their sampled and looped roots including tracks from Biz Markie / Freddie Scott , Eric B & Rakim / Bobby Bird, Lupe Fiasco / International Record from Philippines, and more joints from Tu Pac, Dr. DRE and Eminem. 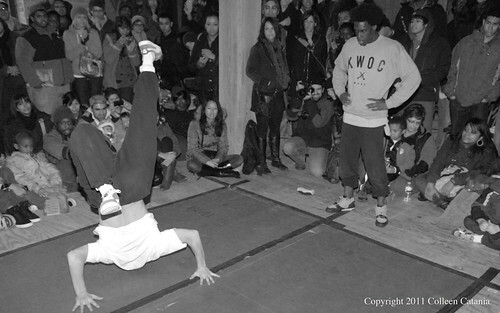 After the sampling showcase, about 200 fans walked down the street and headed to the b-boy battle where the winner would be chosen by a panel of judges comprised of members form the legendary Breakheadz crew. Before the battle got started, the MC told us that due to electrical limitations they had to choose between lights or sound when setting the battle up in the building, and since you can’t have a battle without the beats, they obviously opted for sound. That said, there also wasn’t any heat in the building and it was a bit chilly so the Block Party staff was there kindly handing out packages of hand warmers when we walked in. But I never needed to open my free packaged hand-heaters because the battle provided all the heat I needed to stay warm. And as you can tell by Colleen’s epically sweet shots, the “First Come, First Served” battle was electric and pulsing with energy, start to finish. This being only my second official b-boy battle I’ve been to, it was tons of fun to see this element of hip hop culture in all its glory once again, and to witness the fans loving every minute of it. I watched in awe as the breakers moved, grooved and twisted their bodies into crazy poses and acrobatic forms soaking up and re-interpreting the essence of James Brown and other funky drum breaks and beats, I couldn’t help but think how much of a test of endurance, stamina and supreme skill b-boy battles are. I’ve believed this for a long time but I’ll tell you again, b-boying is not only a physical test of endurance and stamina, but when you study the art long enough and watch the artistry of what’s happening, you quickly realize that b-boying is also a sacred challenge to explore the depth and realize the strength of the creative soul. 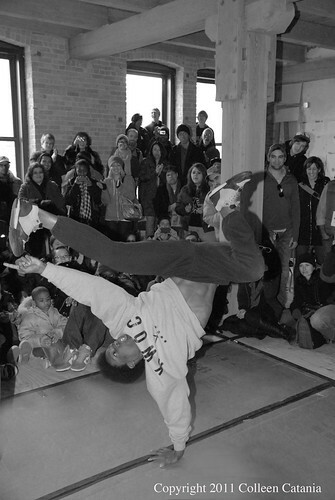 And I also kept thinking during the battle how I’d like to explore the connection between break-dancing’s history of self-expression and the impact it has on the human body. That said, it would have been even better if members of the Brickheadz crew would have taken some time to educate fans about the art of b-boying just like DJ Epic did during his sampling 101 showcase earlier in the day. Yes, it was awesome to watch the breakers express themselves and pull off killer after killer move, but fans would have certainly benefited from a bit of education on what the b-boys were doing and the history behind the art form. Basically, I would have liked to there to be more telling instead of just a lot of showing. I also talked with a few fans after the battle and we talked about how it would really be something if we could explore the physiology and the physics of break-dancing, and take a deeper dive into the scientific side of what these gravity-defying b-boys are doing. In the near future, I hope we can talk to members of the Brickheadz crew or the battle winner Black Attack (above) and have them enlighten us about all aspects of hip hop dance and its strong connection to physical endurance and self-expression. This next MP3 captures my favorite moments during the Open Mic, where emotive spoken word dedicated to the late poet Kent Foreman, a crowd-pleasing call-and-response by DJ Napalm, and Minnie Mango’s “Concrete Roses” took us to higher ground and enlightened our collective consciousness. Later in the evening, and going back in time to the historic days of Chicago House, WBEZ’s Kevin Kobal hosted a Q&A with the founders of Chicago House. I learned a lot during the talk as Robert Williams, owner of the Warehouse and Music Box, and the producers and DJs Vince Lawrence and Chip E told stories of what it was like to go to shows and be a part of a live music scene that forever changed music history and dance club culture. It was an insightful and legendary forum that WBEZ will be airing in its entirety in June, but until then, via Live Fix upcoming posts, we’ll exploring more about jacking, the Chicago house documentaries Unusual Suspects and Pump Up The Volume and other topics covered during the forum discussion. 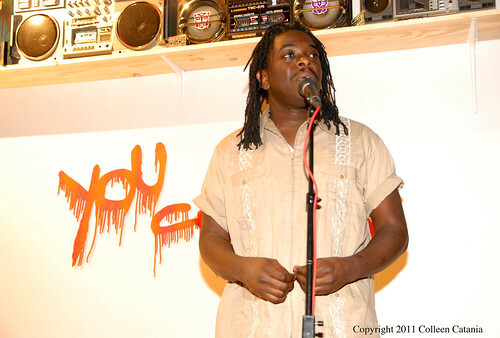 But for now, I’m excited to share with you one of my favorite moments of the entire Block Party, a spoken word piece about house club culture performed by stalwart Chicago-native poet Reggie Gibson during the Q&A. Ever since I heard Gibson’s poem I’ve been so amazed by it that I’ve been repeating it out loud and in my head just so I can hear the beauty and energy of the language Gibson used again and again. Take a listen to the recording below that I snagged and you’ll hear what I’m talking about. That’s it for now. And I thank you for following along. Check out more photos from the entire Block Party on Colleen’s Flickr site. If you were at the HIP HOP Block Party, we’d love to hear what you thought of it and have you share you stories too — tell us all about it the comments below!